A Perseid meteor captured on Aug. 11, 2016 by a NASA camera in northern Ohio. 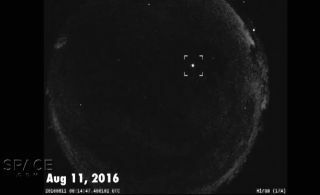 The newly released Perseid video shows meteors captured from July 26 through today by NASA's All Sky Fireball Network, a system of 15 cameras scattered throughout the country. The Perseid shower occurs every year from mid-July through late August. It results when Earth plows through the dust and other debris shed over the eons by the 16-mile-wide (26 kilometers) Comet Swift-Tuttle, which orbits the sun once every 133 years. The Perseids received their name because the meteors appear to radiate from the constellation Perseus. But don't worry too much about finding that particular star pattern; the shooting stars will appear across the night sky. The best viewing will come after midnight in your location. If clouds or bright city lights scuttle your observing plans, you can always watch the Perseid peak online. The Slooh Community Observatory will air a 4-hour webcast tonight, beginning at 8 p.m. EDT (0000 GMT on Aug. 12). The show, which you can watch directly via Slooh or here at Space.com, will feature live shots of Perseid meteors from observatories in four different countries. Editor's note: If you have an amazing photo of this year's Perseid meteor shower that you'd like to share for a possible story or image gallery, please contact managing editor Tariq Malik at spacephotos@space.com.